This is great if you are out for the day and want to come back to something tender and succulent. There is a little bit of effort first thing but then leave to slowly cook and tenderise. The vegetables also should be cooked and served with as much love. A great meal to serve if you wish to impress someone. Don’t worry if you can’t stand anchovies these are in the lamb to add depth of flavour and you will not know or taste they are there. It was when I was discussing this blog and mentioned in conversation my ingredients that both my mother and husband told me in horror that neither like anchovies. They do however both adore my slow roast lamb. 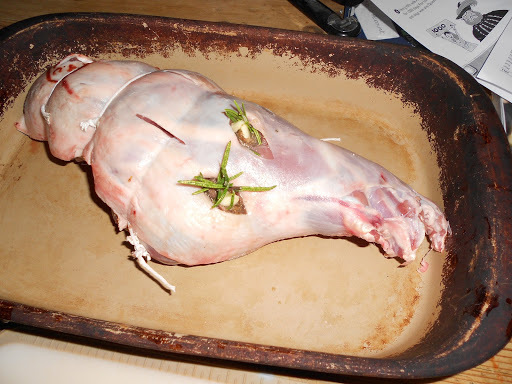 Heat up the oven to a high heat while you dress the lamb. 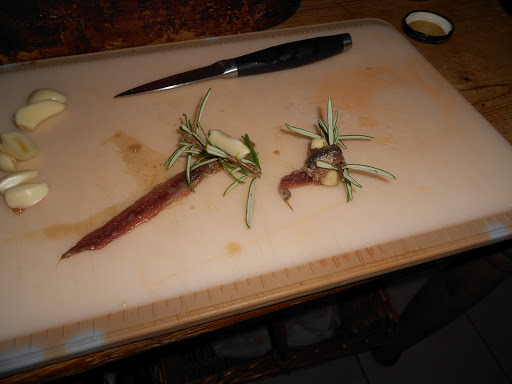 Cut holes in the meat skin, then wrap 1 garlic clove and one small sprig of rosemary in an anchovy, place them in each of the holes. This could do then with a sprinkling of good rock salt and ground pepper but these are optional. 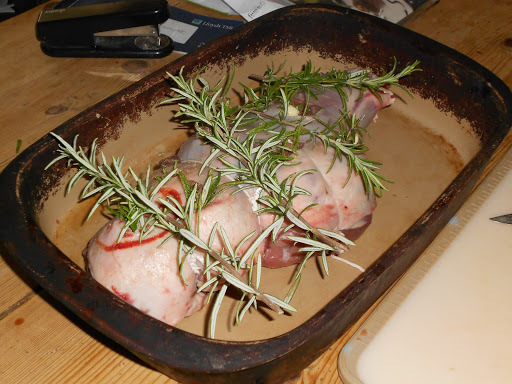 Any spare rosemary can be lain on top of the joint. Put into the preheated oven for 10 to 15 minutes then turn right down to 150° and leave to slow cook for several hours. 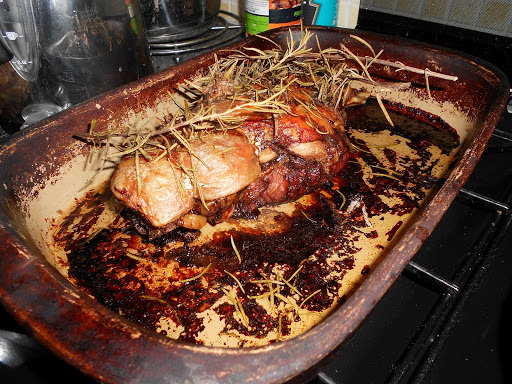 Prior to the meal, remove the meat from the oven, transfer to a carving dish and leave to stand. Save the delicious juices for a gravy. If you have a second oven use it now otherwise bump up the heat again to at least 200° to cook the roasties. Remember par-boiled and shaken in the colander will give them a crispy texture. Add red wine – a good glug to the juices, mix a little veg water with flour and oxo cube then add to pan juices then reheat. If like me you are using pampered chef stoneware that cannot go on the hob, stir well and put back in the oven. Stir often and then serve up with your meat. It helps clean the dish and leaves the gravy full of flavour. Serve with all the trimmings including mint sauce, no carving required as the meat falls off the bone and melts in the mouth. Do give this lamb a try and let me know which vegetables you prefer to serve and how you add taste to these as well. I use my base flavours of garlic, rosemary and mint to bring the vegetables alive.